The music started at the sound of a whistle. There was the rat-tat-tat of drums. The clang of cymbals. The deep buzz of tubas. The airy whistle of flutes. Teenage musicians zig-zagged across the floor. Other teens twirled flags. Two more lept into the air. Marching band practice at Colony High School gymnasium in Palmer had begun. And on this Saturday morning in mid-November, band members said they were giving it their all. It was their last practice before they took their show to New York City. On Thursday, the 100 or so band members will march, twirl and leap down city streets in the Macy's Thanksgiving Day Parade, a televised performance viewed by tens of millions of people. Of the 175 acts nationwide that applied for a spot in the annual holiday show, Colony High was one of just a dozen bands chosen to perform. It's the first full band from Alaska featured in the parade in the event's 91 years. "I've never been to New York City but I'm like really excited because it's going to be so much fun," said Rheannon Williams, the 17-year-old co-captain of the high school Color Guard. 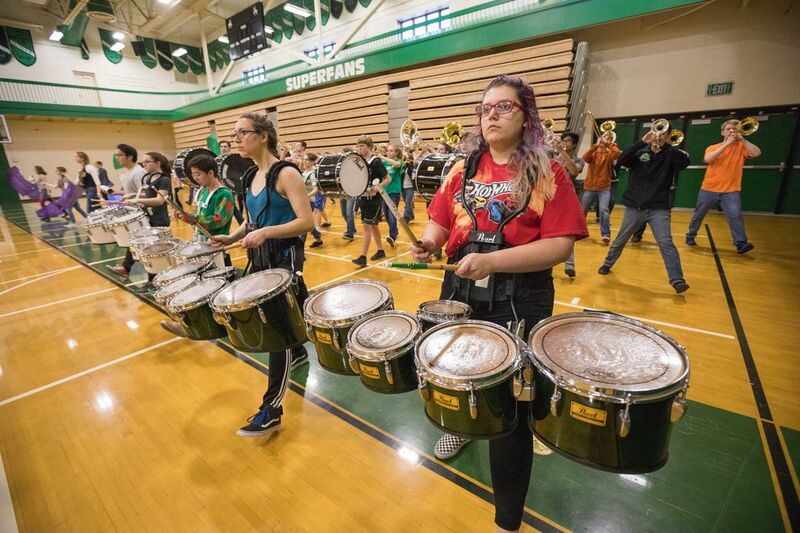 In the Colony High marching band's 13 years, it has already built an impressive resume that includes performances at the 2009 U.S. presidential inauguration, the National Independence Day Parade in Washington, D.C., the Rose Parade and the Sugar Bowl. "I think Macy's will be my new favorite moment," said Leah Smith, a 17-year-old dancer in the marching band. The band, known as Thee Northern Sound, is one of only two high school marching bands in Alaska. The other, at Houston High, started this year. In other states, high school marching bands are everywhere. 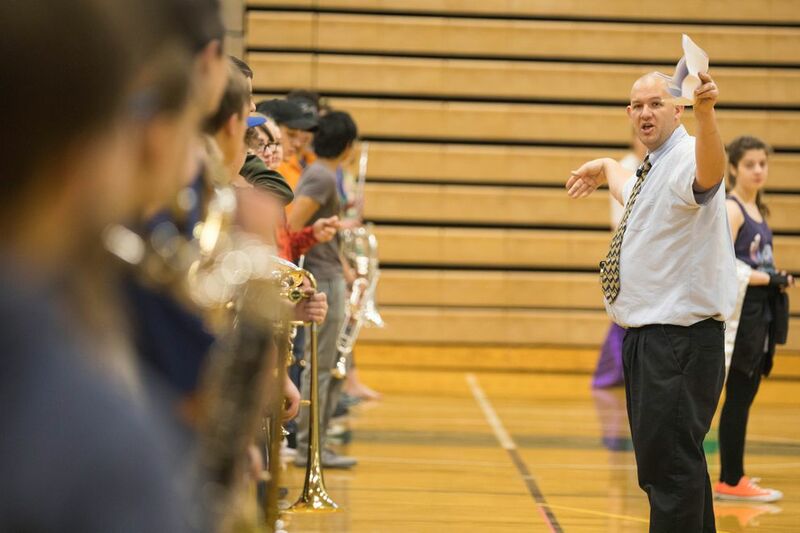 But the tradition just didn't seem to catch on in Alaska, said Jamin Burton, director of bands at Colony High. Burton said he knew he wanted to direct a marching band ever since he played sousaphone in one at his high school in Utah. Back then, he didn't know he would eventually end up in Alaska. "But we made that decision and then I knew I was going to have to start one if I was going to have one," he said. During Burton's first year at Colony High, he cobbled together a three-person drumline. The next year, in 2005, the drumline blossomed into a tiny marching band of about 20, with more than a half-dozen instruments including a flute, trumpet, tuba and snare drum. "We had one student who had moved in from out of state who had done marching band for a year," Burton said. "Everyone else had no experience at all." Every year since its inception, the Colony High marching band has grown. It now draws students from across the Matanuska-Susitna Borough School District. When the band isn't performing on a national stage, they're marching at local football games. That is, unless temperatures dip below about 28 degrees and the instruments' valves "start literally freezing," Burton said. "People will come to the football games just to watch the band," said Smith, who started dancing with the marching band her sophomore year. "They scream people's names, and it's like the most amazing feeling ever." To prepare for the Macy's Day parade, Burton said, the band started practicing in January. It had four weeks of camp over the summer — for two weeks, the camp lasted 10 hours each day. It's like two-a-days for a football team. The marching band watches YouTube videos of Lower 48 bands for inspiration. The students memorize songs and their own choreography. "It's like synchronized swimming but 10 times harder," Williams said. "Be aggressive," Burton told the teens during the band's last practice this month, standing in front of them with a whistle around his neck. "Have a little bit of arrogance. "You want to be putting on the most sassy and most purposeful visual." Nearly every member of the band will go to New York City, each paying their own way either through fundraising or other means. A few students who graduated this spring will meet them in the city. They'll practice, visit museums, go to plays and just spend time together. Several band members, including 16-year-old Charlie Carte, described the band as basically "one big family." And Carte, a drum major, thinks they're having their best year yet. "We worked really hard," he said. "We have a really good group of kids who are really dedicated to what they do." 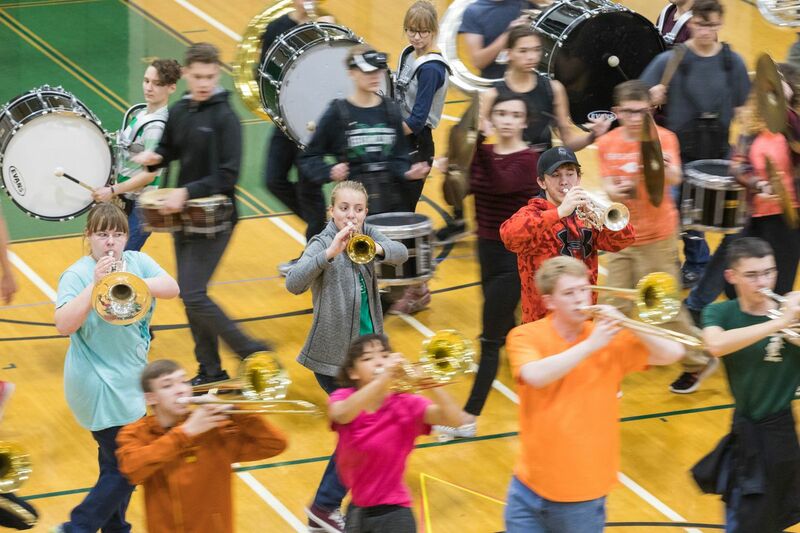 To watch Colony High perform in the Macy's parade from Alaska tune into NBC between about 11 a.m. and 11:30 a.m. Thursday.